It’s cold, must be 4H Show time! The 4H shows are kicking off in about 2 weeks for us. The ladies of the farm have been working hard on getting the does prepared for their days of glory. We have three weeks back to back to back of shows. Starting with the county show and then onto the regionals and then “The Big Show”, the Dixie National Rodeo 4H Livestock Show in Jackson MS. We’ve never been to Dixie before so we’re really excited. So along with their regularly monthly grooming, the ladies have given the does their first trimming. We decided as it’s been SO cold lately that we will not give them a complete shaving for the show, just get them trimmed so they look nice. No need to put them through too much stress of freezing just for show. They’ll have their new coats to wear, along with their sweaters if need be to keep them warm, but still I wouldn’t want to be bald in the winter either. 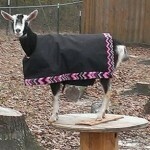 The doe pictured is Marlena, she’s wearing a coat designed and made by Jenny on the farm. 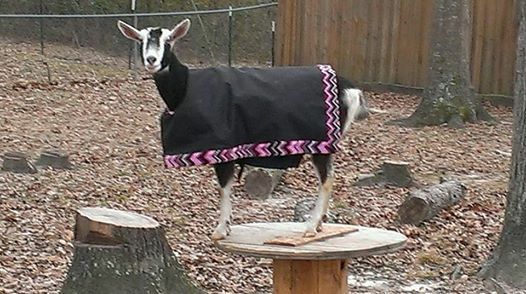 Marlena isn’t much of a cold weather goat. Still some final finishing touches, trimming and bathing will need to be done before show, but most of the work is done long before this point, such as their feeding and normal care regime. We carefully select what each doe gets to eat based on their individual needs, not only to get them ready for show but for a happy healthy life as well. Just as we do for ourselves. So stay warm out there and we’ll see you after show season with updates on how things went. We hope for the best and wish all of you showing your goats good luck! If you haven’t already, come check out our YouTube channel and see what we’ve got going on.